Recent studies based on aerosol mass spectrometer measurements revealed that the organic fraction dominates the non-refractory PM1 composition. However its representation in chemical transport models is still very challenging due to uncertainties in emission sources and formation pathways. In this study, a novel organic aerosol scheme was tested in the regional air quality model CAMx and results were compared with ambient measurements at 11 different sites in Europe. A yearlong (2013) air-quality simulation was conducted to provide detailed temporal and spatial information of ozone, PM2.5 total and chemical components. The paper firstly compared the simulated air pollutants in China with country-wide public available observations for a whole year. It proves the ability of CMAQ in reproducing severe air pollution in China, shows directions that need to be improved, and benefits future source apportionment and human exposure studies. Atmospheric ammonia (NH3) measured by the IASI satellite instrument is compared to observations from ground-based FTIR instruments. The seasonal cycles of NH3 in both datasets are consistent for most sites. Correlations are found to be high at sites with considerable NH3 levels, whereas correlations are lower at sites with low NH3 levels close to the detection limit of the IASI instrument. The study's results further indicate that the IASI-NH3 product performs better than earlier estimates. The effects of climate change would partly counteract the emission-driven increase in PM2.5 in winter in most of eastern China, but exacerbate PM2.5 pollution in summer in North China Plain. Land cover and land use change might partially offset the increase in summertime PM2.5 but further enhance wintertime PM2.5 in the model by modifying the dry deposition of various PM2.5 precursors and biogenic volatile organic compound emissions, which also act as important factors in modulating air quality. In-cloud measurements of aerosol hygroscopicity and cloud droplet activation were conducted in Kuopio, Finland. According to the observations, the less hygroscopic accumulation mode particles were present in the non-activated aerosol, whereas the more hygroscopic particles were scavenged into cloud droplets. The results illustrate the sensitivity of cloud droplet formation to varying chemical composition and highlight the need for proper treatment of anthropogenic aerosols in CCN predictions. This paper presents a method to adjust the sinks and sources of CO2 associated with land ecosystems within a global atmospheric CO2 forecasting system in order to reduce the errors in the forecast. This is done by combining information on (1) retrospective fluxes estimated by a global flux inversion system, (2) land-use information, and (3) simulated fluxes from the model. Because the method is simple and flexible, it can easily run in real time as part of a forecasting system. This paper presents the first combined measurements of both ammonium nitrate aerosols and their gaseous precursors (HNO3, NH3) in the Paris megacity, obtained during the FRANCIPOL and PARTICULES campaigns. This data set is used to investigate the nitrate formation regime within the city, which is particularly important considering the high contribution of nitrates in the fine aerosol pollution of Paris. In addition, it is also used to evaluate the CHIMERE chemistry-transport model. Vertical profiles of black carbon within 1 km above the ground were measured using a micro-aethalometer attached to a tethered balloon during the VOGA field campaign in summer 2014 at a semirural site in the North China Plain. The diurnal cycle of black carbon vertical distributions following the development of the mixing layer was analyzed for a selected dataset of 67 profiles. The GROMOS radiometer in Bern has been part of the NDACC since 1994. Our time series of stratospheric ozone profiles allow the assessment of natural oscillations, which are essential for the evaluation of detected stratospheric ozone trends. Among our new findings are the link between the upper stratospheric O3-SAO and the polar stratopause warmings in winter. We have also detected a strong peak amplitude of 5 % related to the solar activity cycle and the ENSO effect in ozone at midlatitudes. A dual isotope ratio mass spectrometric system (IRMS) and a quantum cascade laser absorption spectroscopy (QCLAS)-based technique were deployed at the Cabauw experimental site for atmospheric research (CESAR) in the Netherlands and performed in situ, high-frequency (approx. hourly) measurements for a period of more than 5 months, yielding a combined dataset with more than 2500 measurements of both δ13C and δD. The Asian Summer Monsoon has implication on the weather and climate system as well as pollutants concentration over the monsoon regions leading to effects on the global air quality. Our results, combining satellite, aircraft and ground station data, show that tropospheric ozone, decrease during the period May–August over East and South Asia due to the Monsoon. The magnitude of this drop depends largely on meteorology and geographic location. HF, the dominant stratospheric fluorine reservoir, results from the atmospheric degradation of anthropogenic species such as CFCs, HCFCs, and HFCs. All are strong greenhouse gases, and CFCs and HCFCs deplete stratospheric ozone. We report the comparison of HF global distributions and trends measured by the ACE-FTS and HALOE satellite instruments with the output of SLIMCAT, a chemical transport model. The global HF trends reveal a slowing down in the rate of increase of HF since the 1990s. There are relatively few long-term, direct measurements of pollutant emissions in urban settings. We present over 3 years of measurements of fluxes of CO, CO2 and CH4, study their respective temporal and spatial dynamics and offer an independent verification of the London Atmospheric Emissions Inventory. CO and CO2 were strongly controlled by traffic and well characterised by the inventory whilst measured CH4 was two-fold larger and linked to natural gas usage and perhaps biogenic sources. Our study presents measurements and model simulations of boundary layer evolution over a mountain peak in the central Himalayas. The observations were made as a part of the Ganges Valley Aerosol Experiment. The implications of biases in model simulated boundary layer towards simulations of trace species is investigated. We probe thin layered clouds with remote sensing instruments from ground in order to get insight into atmospheric processes like the formation of rain or snow. We think that the findings of our work can be used to improve climate and weather simulations. The present paper presents a new technique that can be used to detect the shape, fall speed and mass of ice particles falling from layered clouds. With such information the impact of cloud ice, e.g., on the lifetime of a cloud, can be estimated. We investigate the impacts of current (2010) and future (2020) oil palm plantations across Southeast Asia on surface–atmosphere exchange and air quality using satellite data, land maps, and a chemical transport model. These changes lead to increases in surface ozone and particulate matter. Oil palm plantations are likely to continue to degrade regional air quality in the coming decade and hinder efforts to achieve air quality regulations in major urban areas such as Kuala Lumpur and Singapore. We compiled the available observations of surface O3 at Mt. Tai – the highest mountain in the North China Plain, and found a significant increase of O3 concenrations from 2003 to 2015. The observed O3 increase was mainly due to the increase of O3 precursors, especially VOCs. Our analysis shows that controlling NOx alone, in the absence of VOC controls, is not sufficient to reduce regional O3 levels in North China in a short period. We test new parameterizations for secondary inorganic aerosols in GISS ModelE. To evaluate the model performance, we use measurements of these aerosols and gaseous precursors from surface and aircraft measurements over the USA and Europe. We show that considering the size distribution of these particles, as well as a variety of formation pathways, is important. 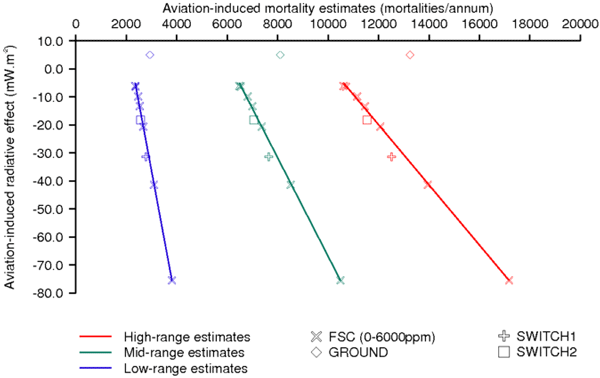 Overall, our model underestimates the aerosol mass compared to measurements, while gaseous precursors are overestimated. Wet removal of atmospheric black carbon particles was quantitatively characterized in terms of accumulated precipitation along a backward trajectory (APT) using long-term observations at Fukue Island, western Japan, receiving Asian continental outflow with variable degrees of influence from precipitation. The emission inventory of BC over East Asia was assessed in terms of the observed BC/CO ratios. Model simulations should be diagnosed with these improved knowledge on the emission and removal. Extreme haze events occurred frequently over China recently, and adequately predicting peak PM2.5 concentrations is still challenging. In this study, the sulfate–nitrate–ammonium relevant heterogeneous reactions were parameterized for the first time in the WRF-Chem model. We evaluated the performance of WRF-Chem and used the model to investigate the sensitivity of heterogeneous reactions on simulated peak sulfate, nitrate, and ammonium concentrations in the vicinity of Beijing during October 2014. Chlorine monoxide (ClO) is central to the formation of the springtime Antarctic ozone hole since it is the catalytic agent in the most important ozone-depleting chemical cycle. 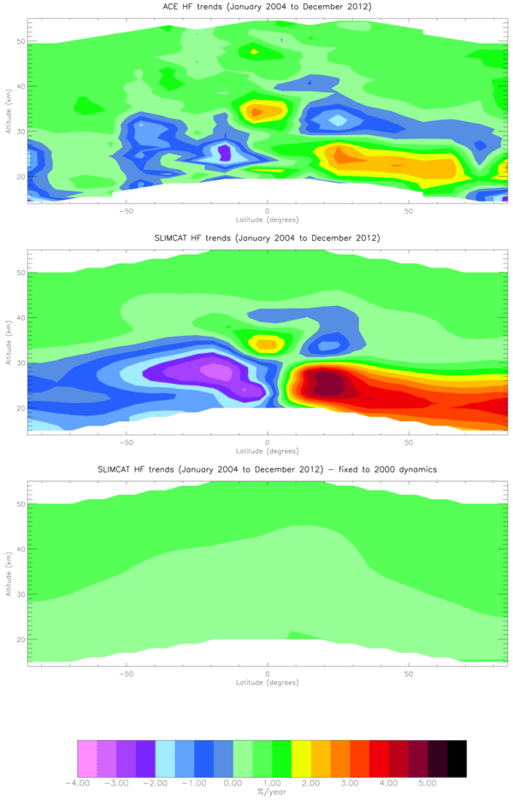 We present 20 years of measurements of ClO from the Chlorine monOxide Experiment at Scott Base, Antarctica, and 12 years of measurements from the Aura Microwave Limb Sounder to show that the trends in ClO during the ozone hole season are consistent with changes in stratospheric chlorine observed elsewhere. This is a synthesis of the atmospheric mercury (Hg) monitoring data available in recent years (2011–2015) in the Arctic and in Antarctica along with a comparison of these observations with numerical simulations using four cutting-edge global models. Based on this comparison, we discuss whether the processes that affect atmospheric Hg seasonality and interannual variability are appropriately represented in the models, and identify remaining research gaps.